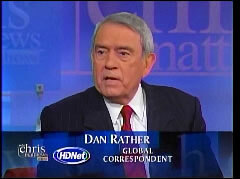 DAN RATHER: Part of the undertow in the coming election is going to be President Obama's leadership. And the Republicans will make a case and a lot of independents will buy this argument. "Listen he just hasn't been, look at the health care bill. It was his number one priority. It took him forever to get it through and he had to compromise it to death." And a version of, "Listen he's a nice person, he's very articulate" this is what's been used against him, "but he couldn't sell watermelons if it, you gave him the state troopers to flag down the traffic." CHRIS MATTHEWS: Will health care, the health care bill of Barack Obama, the one he roughly is for now, coming out of the Senate and coming out of the House. Will it become law? Will he win? DAN RATHER: Yes because what we have now is basically a Republican health care bill, if it gets through. It's, it's got a lot...but I think the President finally putting his whole sack in on it, yes he wins but it's not a certain thing. MATTHEWS: So in other words they'll make it happen. MITCHELL: They've got to make it happen. JOE KLEIN, TIME: Congressional Democrats are dreadful but they're not entirely stupid. They have to pass it. MATTHEWS: And Nancy Pelosi will have her greatest triumph. RATHER: When you talk about a triumph though. One, part of the undertow in the coming election is going to be President Obama's leadership. And the Republicans will make a case and a lot of independents will buy this argument. "Listen he just hasn't been, look at the health care bill. It was his number one priority. It took him forever to get it through and he had to compromise it to death." And a version of, "Listen he's a nice person, he's very articulate" this is what's been used against him, "but he couldn't sell watermelons if it, you gave him the state troopers to flag down the traffic." Before that exchange Rather and Andrea Mitchell, as noted by NB's Noel Sheppard, agreed that Obama made a big mistake by pushing health care.